Join us for a free lunch for students, faculty and staff. Containers will be provided, only one trip through the buffet per guest. 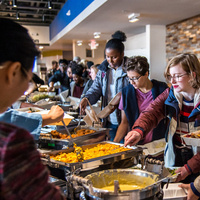 The Thanksgiving Gorlok Gathering is generously sponsored by the Webster University Board of Trustees.